A sign in Longreach specifies "No Muslims" are allowed. No, this isn't "freedom of speech". It's hate speech. 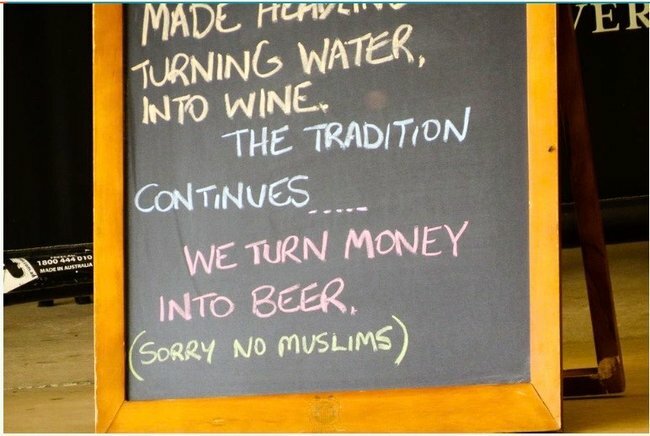 A sign was set up outside a restaurant in outback Queensland this week. 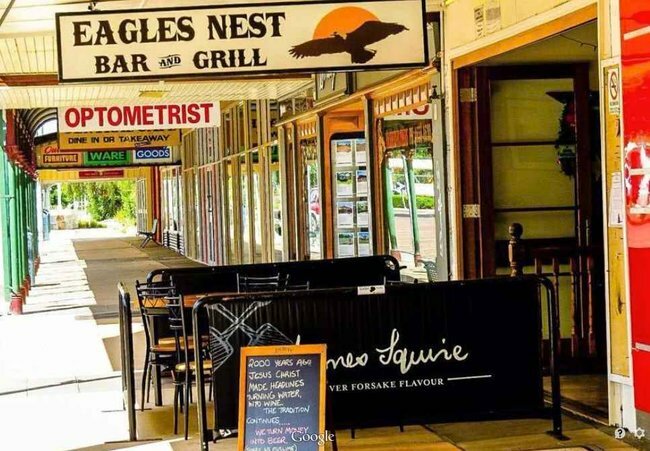 The restaurant — Eagles Nest Bar and Grill in Longreach — has a tradition of scrawling “funny” messages on its pavement chalkboard to attract clientele. But this week, the pub’s sign is going viral — because the sign includes a phrase that was about as far away from funny as you can get. “Sorry, no Muslims“, the sign’s fluoro yellow chalk lettering screamed. A photo of that message was posted to the restaurant’s Facebook page last Friday, was subsequently picked up by Facebook group Boycott Halal in Australia? No Way and has since been shared hundreds of times. The sign from the Longreach Bar and Grill. Unsurprisingly, the blatantly discriminatory sign has started sparking condemnation and debate on social media. Perhaps more surprisingly, the owner, when confronted by criticism over the offensive sign, has made clear that he feels he’s the victim in this story. Yep, owner John Hakwes defended his decision as an expression of “free speech and patriotic sentiment” in an interview with the ABC. Refusing to apologise to Australia’s Muslim community for the message, he also expressed outrage that he had received “more than 200 phone calls” in response to the sign. Now, we can all agree that our democratic society is fundamentally underpinned by a right to free speech. We live in a country that encourages a diversity of opinions and allows hearty debate on issues of national importance — and yep, those who agree we’re lucky to live in such a country can comfortably call ourselves “patriotic”. But let’s be clear on one thing: banning a group of people from entering your restaurant on the basis of their religion — or their gender, or race, or sexuality, or skin colour — is not a helpful expression of “free speech”, and it’s not “patriotic”. It’s discrimination, and it’s hateful, and it needs to stop. Because although Australia endured a tragedy this week when two innocent citizens were killed during the siege at the Lindt Cafe, the mentally unstable gunman who took their lives does not represent all Muslims. That man been condemned and rejected by mainstream, moderate Muslim groups, to the extent that no Muslim leader has agreed to be associated with his burial. 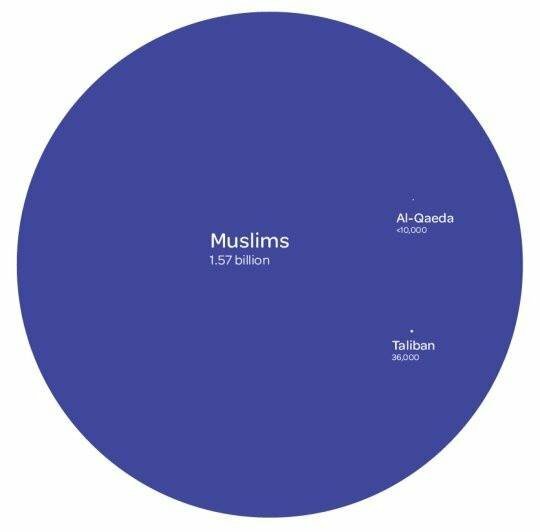 In fact, in the scheme of things, hateful and extremist Muslims are the tiniest of tiny portion of the world’s overall Muslim population –just as violent, middle-aged white male criminals like Martin Bryant, Julian Knight, Brett Cowan, Ivan Milat and Adrian Bayley are a tiny portion of the middle-aged white men in the world, and just as the Ku Klux Klan don’t represent Christianity. So repeat after me: The gunman, along with the Islamic State extremists he tried to align himself with, does not represent Islam. So, if we want to exercise our right to free speech in a useful way; if we want to champion patriotism and celebrate all that makes Australia great; if we want to avoid playing into the hands of terrorists, and if we want to do our bit to build a strong future for Australia? Let’s embrace strong, beautiful messages of solidarity — like those sent to the Muslim community by offering to accompany Muslims on public transport with the hashtag #IllRideWithYou, or like the moment when a Muslim bride lay her wedding bouquet at the Martin Place memorial and was met with spontaneous applause. Because what we need is not more division, but more unity. 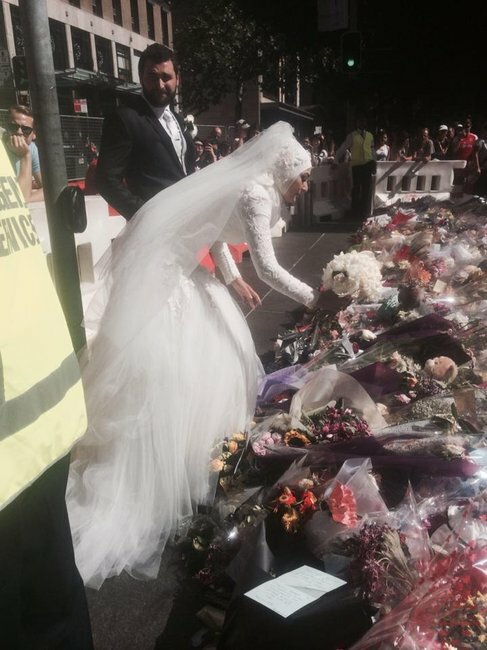 A bride lays her bouquet at the Martin Place memorial on Sunday. Photo: Facebook.